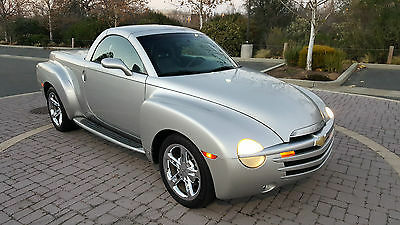 2005 Chevrolet SSR 05 SSR,AUTO,PWR HARD TOP,HTD LTH,BOSE,6 DISK CD, CHROME WHEELS,38K,WE FINANCE!! 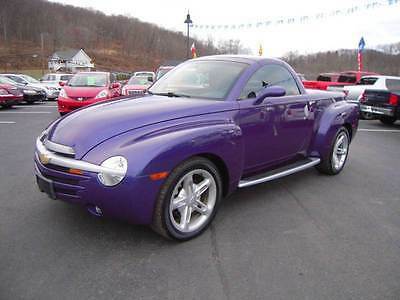 Photos Vital Information Year Make Model Mileage Engine 2005 Chevrolet SSR LS AUTO,HTD LTH,6 DISK CD,CHROME WHLS,38K,WE FINANCE 38,505 6.0L V8 Aluminum SFI Engine Exterior Interior Stock# VIN Ricochet Silver Metallic Ebony #115936 1GCES14H35B115936 view new window sticker Contact Us Dealer Contact Texas Vehicle Exchange Carfax Optional Equipment WHEELS, FRONT 19"[14P]Cost: $1500.00Details:Chrome WheelsREGULAR PRODUCTION ACCESSORY, INTEGRATED RUNNING BOARDS[BVE]Cost: $745.00Details:Running Boards/Side Steps PREFERRED EQUIPMENT GROUP[1SB]Cost: $2000.00Details:Power Mirror(s)Auto-Dimming Rearview MirrorAM/FM StereoCD PlayerHeated MirrorsCD ChangerPremium Sound System REGULAR PRODUCTION ACCESSORY, AUXILIARY GAUGE PACKAGE WITH SATIN CHROME APPEARANCE[ERG]Cost: $400.00 Standard Equipment EPA FUEL ECONOMY RATINGS City 15/hwy 19 (6.0L engine/4-speed auto trans) City 13/hwy 20 (6.0L engine/6-speed manual trans) EXTERIOR Fog lamps, front, halogen Mirrors, outside rearview, power, heated, color-keyed Pwr retractable hard top Glass, Solar-Ray with deep tinted rear window Cargo area hard liner, two-piece (one cargo area, one tailgate), plastic (Upgradeable to (ERK) Cargo Compartment Trim) INTERIOR Mirror, inside rearview, manual day/night, includes dual reading lights Sound system, ETR AM/FM stereo with CD and MP3 player, includes Radio Data System (RDS), seek-and-scan, digital clock, auto-tone control, automatic volume and TheftLock Windows, power, includes driver express-down Cruise control, electronic with set and resume speed, includes telltale in instrument panel cluster Defogger, rear-window, electric Steering wheel, leather-wrapped rim, includes driver information and redundant audio controls Air conditioning, manual Keyless entry, remote, includes power programmable door locks, panic button and rear cargo area cover release Theft-deterrent system, PASSLock Seats, front leather seating surfaces reclining buckets, 6-way power driver seat, 2-way power passenger seat, power lumbar and manual recline Driver Information Center, includes trip computer (personal and business trip odometer, fuel data, estimated range, average fuel economy, instantaneous fuel economy, trip timers and personalization features) and message center (monitors numerous systems including low battery, transmission fluid life, oil level, oil life, washer fluid and door ajar) Antenna, built into windshield Floormats, carpeted front, removable (Not available with (BKF) Customized Floormats) MECHANICAL Trailering equipment, heavy-duty, includes trailering hitch cross member and 7-wire harness Differential, Zexel-torsen, limited-slip, rear, 8.6" rear (automatic transmission only) (Included and only available with (M32) Transmission, 4-speed automatic) Suspension Package, Sport Engine, 6.0L V8 aluminum SFI (390 HP [290.8 KW] @ 5400 rpm, 405 lb.-ft. [546.8 N-m] @ 4400 rpm) Tire sealant and inflator kit Tires, front P255/45R19, touring, blackwall, rear P295/40R20, touring, blackwall Wheels, front 19" x 8" (40.6 cm x 17.8 cm), rear 20" x 10" (50.8 cm x 25.4 cm) painted aluminum, (96P) Ultra Silver finish Rear wheel drive GVWR, 6050 lbs. (2744 kg) Alternator, 145 amps Steering, power Rear axle, 3.73 ratio Transmission, 4-speed automatic, heavy-duty, electronically controlled with overdrive (Includes Differential, Zexel-torsen, limited-slip, 8.6" rear) SAFETY Traction assist system, electronic, switch-operated (Not available with (M10) Transmission, 6-speed manual, Tremec.) 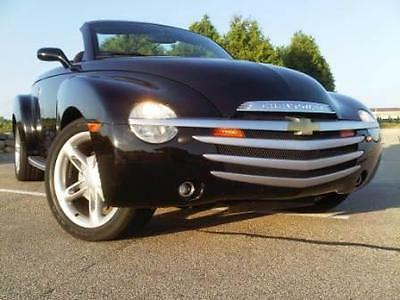 Air bags, frontal and side impact, driver and front passenger Daytime running lamps Brakes, 4-wheel antilock, 4-wheel disc Other Vehicles Currently Available About Us Welcome to Texas Vehicle Exchange! WWW.TVEAUTO.COM Your # 1 Internet driven dealership TEXAS VEHICLE EXCHANGE is located in Carrollton, Texas, (North Dallas) in our 30,000 sq ft indoor showroom. We are a leading internet based auto dealership that provides quality hand picked vehicles to customers all over the country. Our philosophy is based on not being just great at one thing,yet being the best at all things we do. We make the auto buying process very simple for our customers by offering our streamline process while purchasing your vehicle, financing, extended service contracts and even trading your vehicle in. TEXAS VEHICLE EXCHANGE is an independent owned business that excels in customer service, competitive pricing, and quality assurance. We look forward for the opportunity to assist you in a smooth and easy auto buying experience. Sincerely THE TEXAS VEHICLE EXCHANGE TEAM At Texas Vehicle Exchange, we take pride in being a locally-owned member of the Dallas, Texas community. That's why we are the choice dealership for many drivers in the area. We've built our reputation on trust, integrity, and respect, and we're ready to demonstrate our elevated customer service to you. For years, our Dallas, Carrollton, Hialeah and even Plano neighbors have come to us for a trustworthy and hassle-free used vehicle purchase. To see why hundreds buy their used cars from us every year, stop by our dealership today or view our inventory of used cars and trucks from the comfort of your own home online! Used Acura Used BMW Used Buick Used Cadillac Used Chevrolet Used Ford Used Jeep Used Land Rover Used Mercedes-Benz Used Toyota Texas Vehicle Exchange is proud to offer a large selection of used and pre-owned vehicles for our Dallas customers to test drive on our lot. If you are looking for a low priced used car that looks and drives like new, Texas Vehicle Exchange is the place to find it. We are also the dealership to visit if you're interested in customizing and modifying Jeeps to your personal preferences! Just see for yourself the kinds of changes we can make to the exterior and interior of our custom Jeeps. Here at Texas Vehicle Exchange, we know that the used car-buying process can be stressful. Don't worry! With us, you don't have to go all over town to get your automotive needs met. You can even apply for car financing right now with our online application. Please call us, fill out our contact form, or visit our convenient Carrollton TX location and tell us how we can make your car buying process hassle-free. We look forward to meeting you and putting you behind the wheel of your next vehicle! Recommended Links Texas Vehicle Exchange recommends financing from Autocritic. Please click below to apply online. Notice to Bidders There is a $150.00 document and processing fee added to the purchase price of each vehicle. In addition Texas residents are also responsible for all tax, title and licensing fees. A $500.OO down payment is due within 24 hours and is non-refundable should you not complete the purchase. Full payment is due within 7 days unless pre approved by the seller. TEXAS VEHICLE EXCHANGE DOES ACCEPT TRADES. PLEASE SEND A COMPLETE DESCRIPTION OF YOUR TRADE INCLUDING COLOR, MILES, CONDITION AND ANY ISSUES ALONG WITH THE COMPLETE VIN NUMBER AND A FEW PHOTOS TO mike@tveauto.com AND WE WILL GET YOU A PRICE ON THE TRADE. PLEASE MENTION THE VEHICLE YOU ARE INTERESTED IN IN THE EMAIL. Payment Types Direct Bank Wire Transfer, Certified Funds, Institutional Financing TEXAS VEHICLE EXCHANGE OFFERS NATION WIDE FINANCING SAME DAY APPROVAL IN MOST CASES Fees Out of State BuyersOut of state buyers are not charged tax, title, or license. The customer is responsible for registering the vehicle in their home state. There is a $150 document and processing fee added to each purchase.Taxes and FeesIn state (Texas) buyers will be charged state and local taxes, title, registration, and documentary fees.DepositWe require a $500.00 NON-REFUNDABLE down payment within 24 hours of winning the auction. Please make the deposit via Pay Pal after purchase notification from eBay. VEHICLE INVENTORY TAX: A VEHICLE INVENTORY TAX WILL BE ADDED TO EACH PURCHASE BOTH IN STATE AND OUT OF STATE AS WELL AS "FOR EXPORT" VEHICLES. THE VIT TAX RATE IS .002152 Terms Auction Policies BUYER SHOULD HAVE FINANCING IN PLACE OR HAVE FUNDS AVAILABLE BEFORE PLACING AN OFFER ON ANY VEHICLE. CUSTOMERS WITH ZERO OR NEGATIVE FEEDBACK ON eBAY MOTORS - PLEASE CONTACT TEXAS VEHICLE EXCHANGE PRIOR TO BIDDING, Otherwise, we reserve the right to cancel your bid. Understand this is only to protect the integrity of the auction. Winning bidder must contact the dealership within 24 hours of the auction close and have the purchase transaction completed within 7 calendar days. 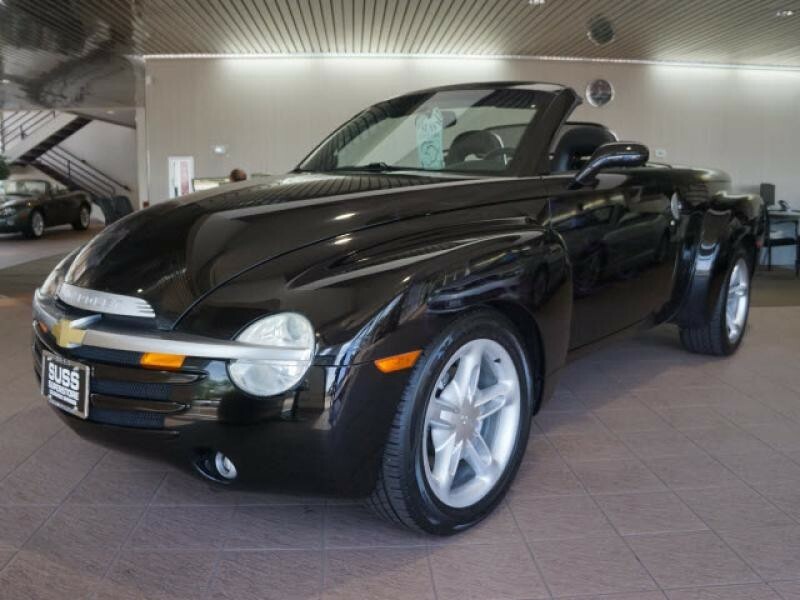 We reserve the right to re-list or sell the vehicle in the event of a non-paying bidder. Buyer Pickup A representative from our dealership can be available for pickup at area airports when necessary. Buyers must schedule pickup prior to making travel arrangements. We will pick you up at DALLAS/FORT WORTH INTERNATIONAL (DFW) or LOVE FIELD (SOUTHWEST AIRLINES) between 9:00 am to 4:00 pm weekdays and 9:00 am to 3:00 pm on Saturday. 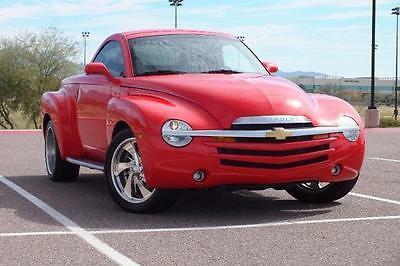 FINANCING TEXAS VEHICLE EXCHANGE OFFERS NATION WIDE FINANCING - SAME DAY APPROVAL IN MOST CASES. THERE IS A $150.00 DOCUMENT FEE ON EACH PURCHASE. SUBMIT CREDIT APPLICATION LOCATED AFTER THE 1ST PICTURE OR CALL 972-242-5377. Ad created by eCarList.com. Call 214-722-8200 to find out how eCarList can service your dealership. 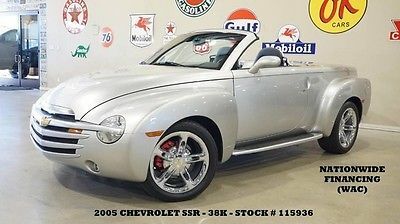 2005 Chevrolet SSR LS AUTO,HTD LTH,6 DISK CD,CHROME WHLS,38K,WE FINAN 05 SSR,AUTO,PWR HARD TOP,HTD LTH,BOSE,6 DISK CD, CHROME WHEELS,38K,WE FINANCE!! 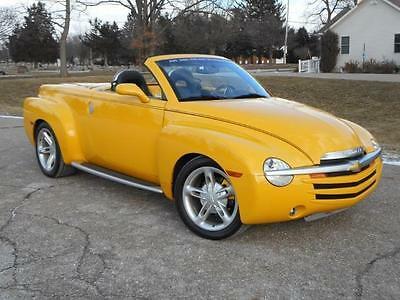 This 2004 Chevrolet SSR is in super clean condition with super low miles. Clean Carfax. Well maintained and all ways garaged by previous owner. Fresh Rubber on the Boyd Coddington Aluminum Wheels. Power top works flawlessly. Super cool cruiser with nice power from the 5.3L V8 with K&N Cold Air Box. JUST 30,338 miles. See photos for how nice this truck really is. FULL DETAIL and FULL TANK of GAS. WE SHIP TO ALL 50 STATES. CALL ME TODAY for more information or in the SCOTTSDALE AREA to schedule a test drive! Contact ROBERT JELINEK at 602-315-4369 CALL or TEXT EMAIL Robert.jelinek@earnhardt.com See BUILD SHEET BELOW. 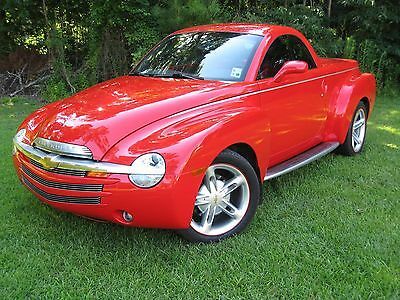 VIN: 1GCES14P34B107342Model: CS15703-2004 CHEVROLET SSR Service Contract: Yes Branded Title: No Warranty Block: No PDI Status: No Order Type: 70 - RETAIL - STOCK Field Actions: 0 Open Vehicle Build Model: CS15703-2004 CHEVROLET SSR Order Number: HCMTG3 Gross Vehicle Weight: 2,747 Build Date: 03/22/2004 Build Plant: B Option Codes *IVH is not the definitive source of GM Vehicle RPO information and is intended for service reference only. Should there be any questions about the vehicle's original build or RPO information please refer to the original vehicle invoice or window sticker. 192 - EBONY 19I - BLACK INTERIOR TRIM 1SB - 1SB PREFERRED EQUIPMENT GROUP CONSISTS OF: ENGINE COVER INSERT MEMORY PACKAGE -SEATS,RADIO,DIC HEATED DRIVER & PASSENGER SEATS ELECTROCHROMIC MIRRORS: INSIDE REARVIEW & LEFT O/S REARVIEW HOMELINK AM/FM STEREO W/IN DASH 6 CD BOSE PREMIUM SOUND SYSTEM OPTION PACKAGE 02 1SZ - PREFERRED EQUIPMENT SAVINGS 6DL - FRONT SPRING 70U - REDLINE RED 7DL - FRONT SPRING 8KL - SUSPENSION 96P - ULTRA SILVER WHEEL PAINT 9KL - SUSPENSION A31 - POWER WINDOWS A95 - HIGH BACK RECLINING BUCKET SEATS WITH FLOOR CONSOLE AAB - MEMORY DRIVER CONVENIENCE PKG AJ1 - DEEP TINTED GLASS AJ7 - DR/PASS FRT & SIDE AIRBAGS AU0 - KEYLESS REMOTE DOOR LOCK B30 - WHEELHOUSING & FLOOR CARPETING BCP - ENGINE COVER INSERT BKF - CUSTOMIZED FLOOR MATS ***DEALER INSTALLED*** BVE - INTEGRATED RUNNING BOARDS ***DEALER INSTALLED*** C49 - ELECTRIC REAR WINDOW DEFOGGER CJ3 - CLIMATE CONTROL DJ2 - ISRVM LT SENSITIVE HOME CONV DNR - DEALER INSTALLED EQUIPMENT DR2 - MIRROR O/S LH & RH REMOTE CONT ELECTRICHEATED LT SENSITIVE MANUAL FOLDING COLOR E55 - TAILGATE BODY EB6 - GVW RATING 6,050 LBS ERK - CARGO COMPARTMENT TRIM W/WOOD EVA - EVAP EMISSION REQUIREMENT G80 - LOCKING DIFFERENTIAL-REAR AXLE GT4 - REAR AXLE - 3.73 RATIO JF8 - BRAKE VAC POWER, 4 WHL DISC JJA - PT DRESS SUBASSEMBLY INSTALLED K34 - ELECTRONIC SPEED CONTROL WITH RESUME SPEED KA1 - HEATED FRONT SEATS HEATED DRIVER SEAT KG3 - 145 AMP ALTERNATOR LM4 - VORTEC 5300 V-8 SFI ENGINE M30 - 4-SPD AUTO TRANS W/ OVERDRIVE AND ELECTRONIC CONTROL N40 - POWER STEERING NC1 - CALIFORNIA EMISSIONS LEV NW7 - TRACTION ASSIST OLF - PLANT CODE - LANSING, MI PD7 - WHEEL, SPARE DELETE PZ7 - WHEELS, 19X8 FRT, 20X10 RR QMX - TIRE, ALL MIXED SIZES FRT & RR R9U - GM ACCESS - AUTOBOOK IDENTIFIER SLM - STOCK ORDERS STW - LEATHER WRAPPED STEERING WHEEL T61 - DAYTIME RUNNING LIGHTS T96 - FRONT FOG LAMPS T98 - STAMPING VEHICLE IDENT NUMBER U68 - DRIVER INFO CENTER DISPLAY U73 - FIXED MAST ANTENNA UA6 - THEFT DETERRENT ALARM SYSTEM UC6 - AM/FM STEREO W/IN-DASH 6 CD UQA - BOSE PREMIUM SOUND SYSTEM V73 - STATEMENT OF VEHICLE CERT.-U.S. /CANADA VG8 - NOTICE TO BUYER LABEL VK3 - FRONT LICENSE PLATE BRACKET FRONT LICENSE PLATE MOUNT VP6 - NOISE CONTROL VXS - COMPLETE VEHICLE LABEL X88 - CHEVROLET CONVERSION YA7 - CALIF. ASSY. LINE EMISSION TEST YC5 - LT DECOR EXTERIOR APPEARANCE PACKAGE YD3 - BASE EQUIP FOR SCH GVW PL-FT AX YD5 - BASE FRONT SPRING YD6 - BASE REAR SPRING YF5 - 50-STATE EMISSIONS Z82 - HD TRAILERING EQUIPMENT ZQ8 - SPORT HANDLING PACKAGE Please email me directly at Robert.jelinek@earnhardt.com or text me your email address for complete CARFAX report to 602-315-4369. 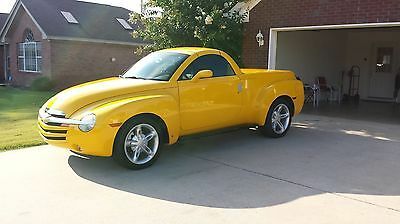 2003 Chevrolet SSR Beautiful SSR, one owner and garage kept. 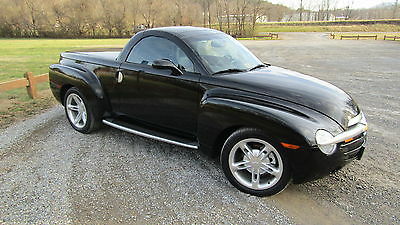 2006 Chevrolet SSR Convertible Pickup 2-Door 2006 CHEVROLET SSR, 6-SPEED, ONE-OWNER, DON'T MISS! Pristine condition, always garaged, upgraded Sport Model w/Bose 4-way speakers, dual heated seats, proximity warning system, custom truck bed, integrated running boards, torch red calipers, frigid air, throaty exhaust. Top hydralics currently inop - needs work. Discounting $1000 to cover repairs by new owner. Has about 6000 miles on all four tires, custom floor & bed mats, 2 keys with remotes, custom car cover included. Three year maintenance history at Victory Layne Chevrolet. My new homeowners association prohibits trucks. Must sell now.